If you own an iPhone 4S, you will have undoubtedly spent many hours playing with Siri and Dictation to test the ability of your handset to search and display information and control the device. Apple might be working on bringing similar controls to the Mac, possibly integrating them tightly with the iPhone, iPad and iPod Touch, but there are already some very viable options available to users that will allow them to use their iPhone 4S to control their Mac computer — one of them being Vocal. 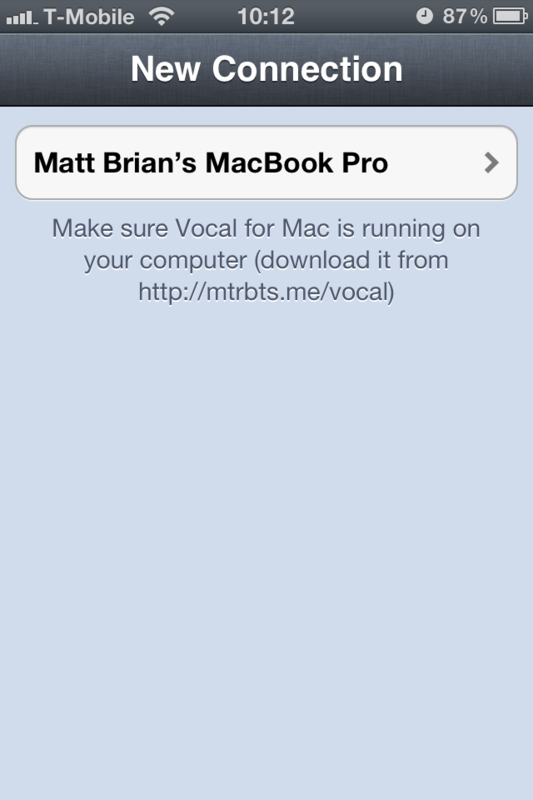 Vocal is an iOS and Mac application, created by Matthew Roberts, that synchronises your iPhone 4S with your Mac to enable the control of apps, perform searches, add, edit and copy text and even issue voice commands to control your song playlists over your Wi-Fi connection. Vocal came essentially from playing with Siri on my new 4S as a sort of “novelty” as I just acquired the device, and since I use my Mac so much I wanted to see if I could write a Siri-like app for it. After looking around the only main competitor was the software from Nuance, but it was over 1GB to download and cost upwards of $50. Considering the 4S can already dictate text, I thought I could make a super simple app “for the masses”, I guess you could say. 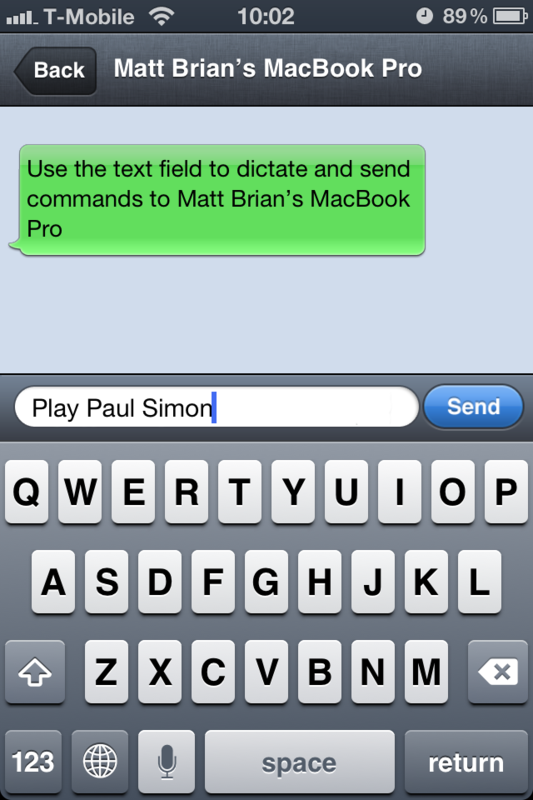 The technology is not new, Vocal simply utilises Dictation on the iPhone 4S to record your commands to the app. However, the real power is in what it can do with the commands that you send it. In order to set up your Mac, you must download the companion Mac application from the Vocal website, install it and then run the iPhone 4S app to synchronise the the two devices. To ensure safety, Vocal will automatically generate a pairing passcode, requiring you to type it in to connect the two devices to one another — stopping other Vocal users from hijacking your connection. 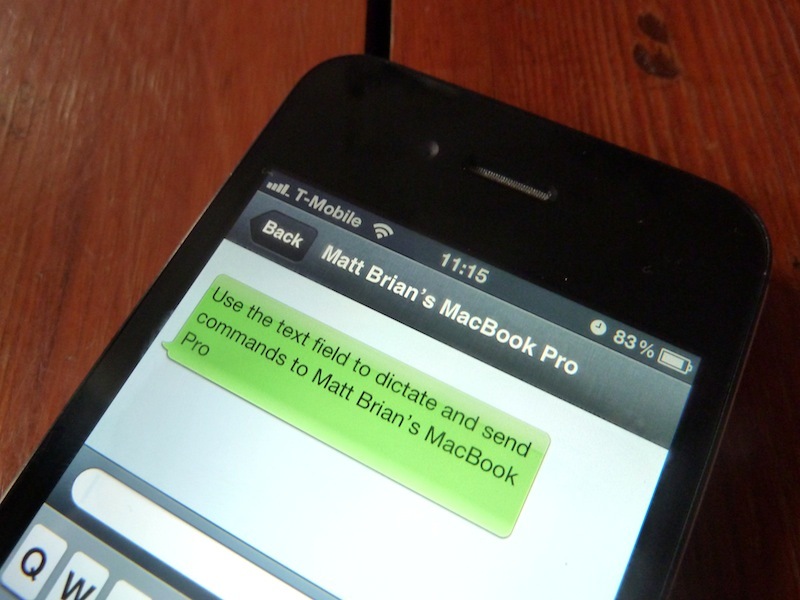 All you have to do is open the app, hit the microphone icon on your iPhone 4S keyboard and then speak a command. The Mac app uses Bonjour, a zero-configuration system designed by Apple, and resides in your Mac’s menu-bar (at the top of the screen), displaying a grey or black icon depending on whether you are connected or not. If that wasn’t enough, the app can be programmed to accept custom commands; if you want to be able to add your own commands, you can. Whilst this isn’t the easiest thing to do, in the respect that it is difficult to understand which commands a specific application will support, the app gives you complete control over what you want to test, a trial and error process if you will. [This is something that] I haven’t worked out how to convey to the user, but I added it as a part of my Vocal support page at http://mtrbts.me/vocal/#support. I guess I was hoping users might see the demo video and try out a few things, so much of the command writing was guessing what people want to do. The best thing about Vocal at this stage is that if people want some custom commands to control some part of their computer, if it can be done through a URL or AppleScript I can just push it out to them instantly “over the air”. 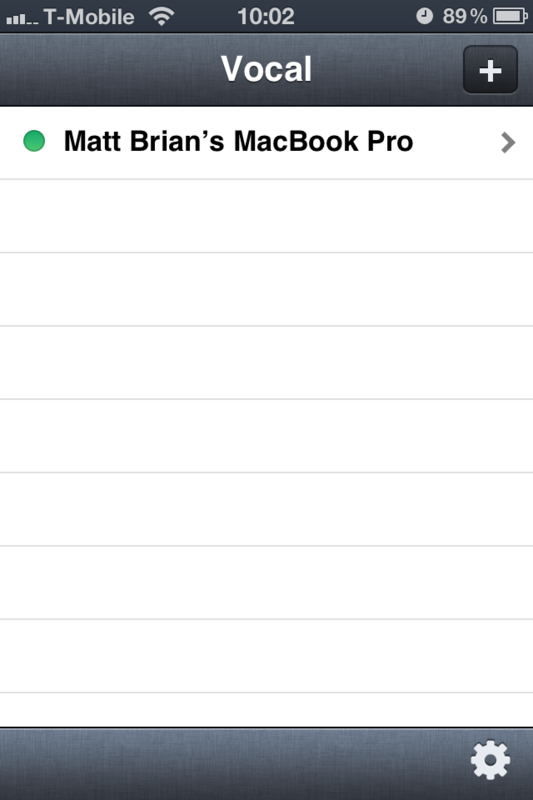 Over the air updates are pushed to the Mac companion application in order to provide users with more commands. Roberts says that he will add more to the app as more requests come in. You can add your own commands through the custom bookmarks menu, but adding scripts is something I definitely want to work on. I’m also planning a way for SiriPort extensions to work seamlessly with Vocal as well, so being able to tap into that already growing community for great tools to do things like controlling Plex. It reduces some of the burden of me having to come up with the ideas for custom commands, and adds another way that more advanced users could contribute to the app. This is also why the companion Mac app is only available from my website, as when I do add these features they would be rejected from the Mac App Store. The app is likely to never make the Mac App Store as Roberts believes his current techniques would be incompatible with Apple’s sandboxing rules that are due to be enforced. He also adds that he will be able to push out fixes immediately, without having to add review times to his coding and release schedules. 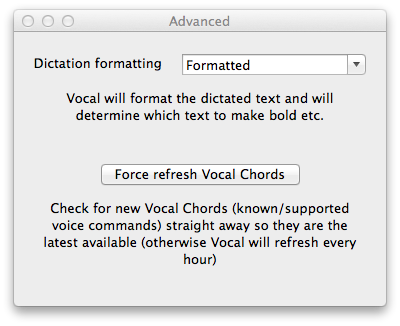 Vocal does have its limitations; for example it cannot be used to load artists within iTunes, due to restrictions enforced by Apple, and manual in-app commands are not yet supported. However, it can load playlists and individual songs, perfect if you don’t want to use AirPlay. Commands like “play next song” will be perfect for users that are having a party and want to control their playlists remotely whilst they mingle. Vocal is a $1.99 download from the App Store with the Mac companion a free download from the Vocal website. If you have been looking for a way to control your computer, or are limited in your ability to operate a mouse, this could be the perfect app for you — if you own an iPhone 4S of course.